Retired geologist, drilling engineer and house husband, about to enjoy an active retirement. I’m writing this a long time after the events described. This is for several reasons. At heart I am lazy – I’m good at finding other things to do, rather than sitting down to write. 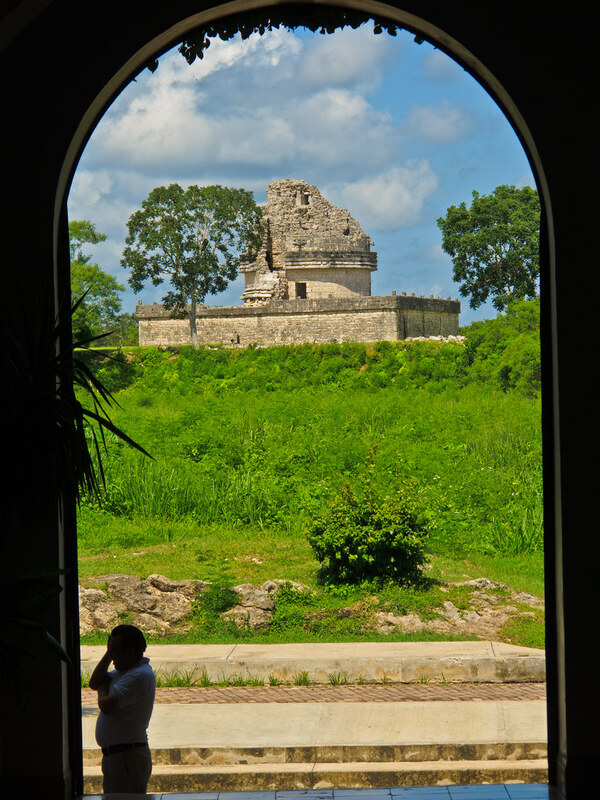 The further removed I get from our time in the Yucatan, the harder it is to write about it. We have been very busy moving into our new home. And lastly, I have been rather ill. In retrospect, more ill than I thought at the time. Some details can be found HERE. I may write more of this in a later post. But for the sake of completeness I need to get the story of our trip round the world finished. 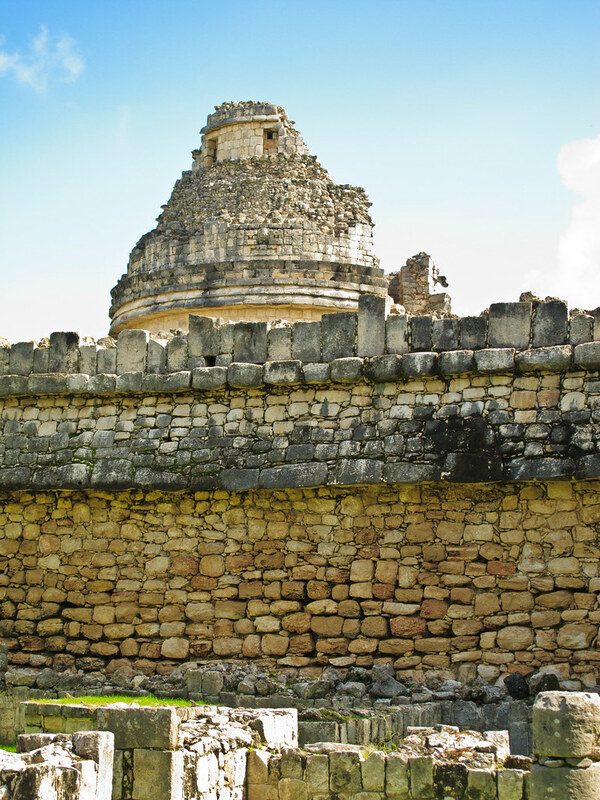 Why is it that the tourist in Mexico always finds him or herself walking round ruins? Surely there are other things to occupy ones time. Well, there are and I will get onto them before too long, but diligent tourists finds themselves walking round Mayan ruins endlessly. They are all over the place and they are all different and, after the first half dozen, all the same. 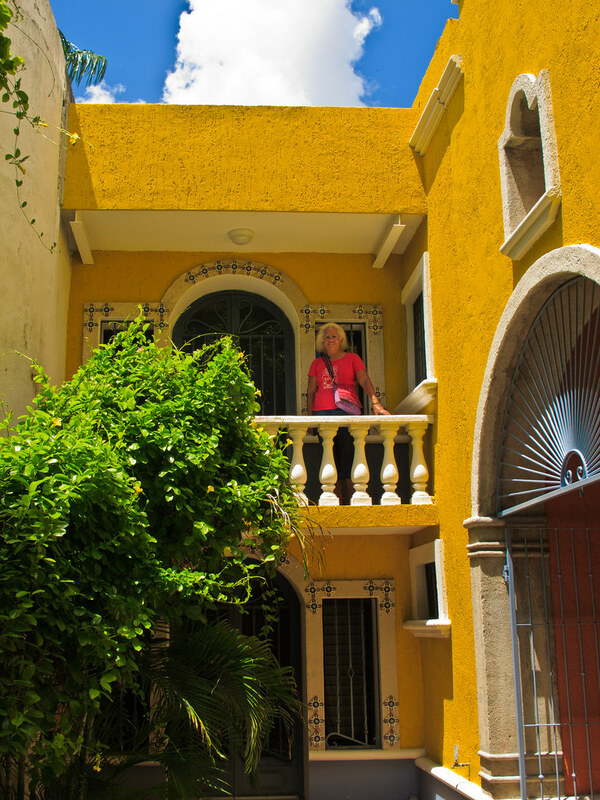 After our week in our very nice hotel on the coast, we headed for Merida, the largest town and capital of the Yucatan. We had booked an apartment near the centre of town, and this had the added advantage of having a swimming pool, which in the heat of a Meridan summer was very welcome. 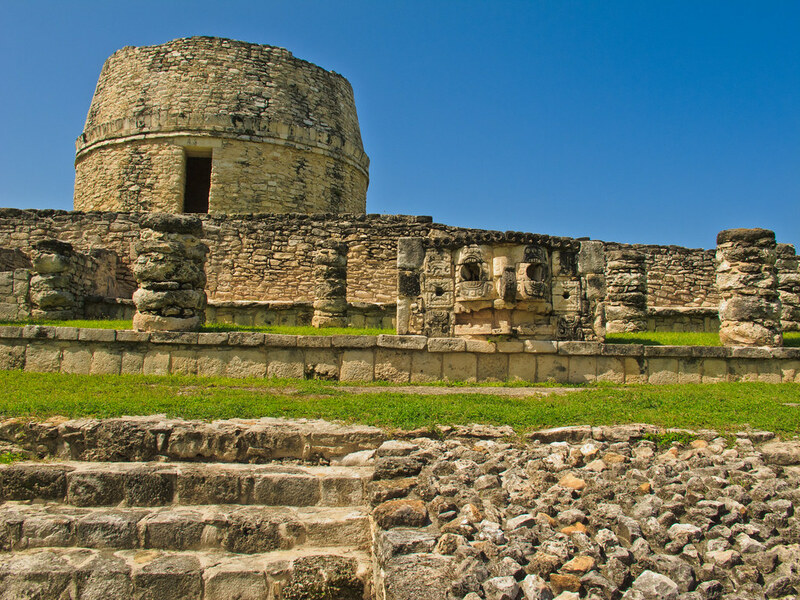 Merida is a big city with the oldest buildings dating from the Spanish Conquest. You can see Mayan stones used in the building of the Cathedral, but as far as I know there are no Mayan buildings in the city. I suppose reminders of a glorious, non-Spanish, past would be a no-no for the Conquistadors. Apparently there had been five pyramids in the place. In the historic centre, which is very large, the street pattern is a rigid grid system, except where it is not. Even numbered streets run North – South and odd numbered East – West. We were at the junction of 72 and 47. 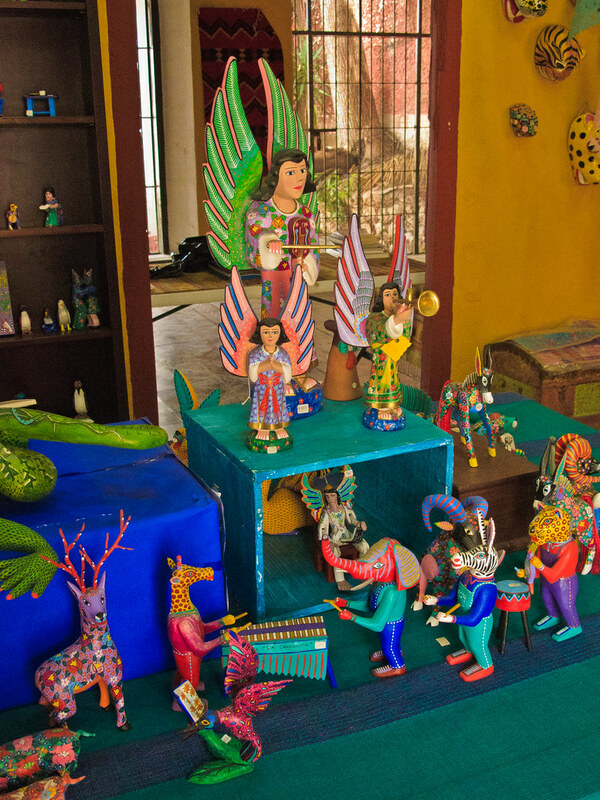 If you want Mexican, and especially, Yucatan, crafts, Merida is the place to come. The local museums are full of good stuff and there are lots of shops willing to sell. A lot of the things show amazing skill; taste is available in abundance, some of it is good. And all prices are subject to negotiation. They come down so quickly and by so much that one wonders how much the original craftsman is getting. 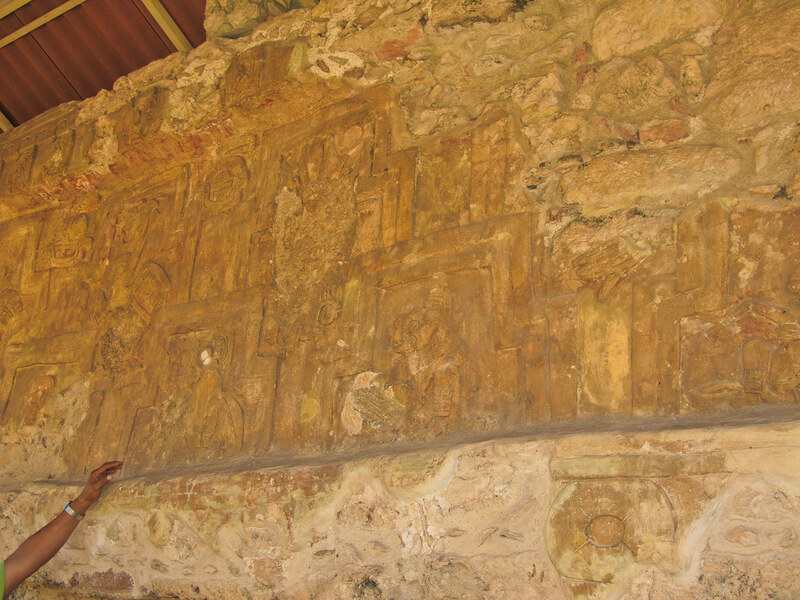 A three dimensional construction, possibly an altar piece, in a Merida museum. 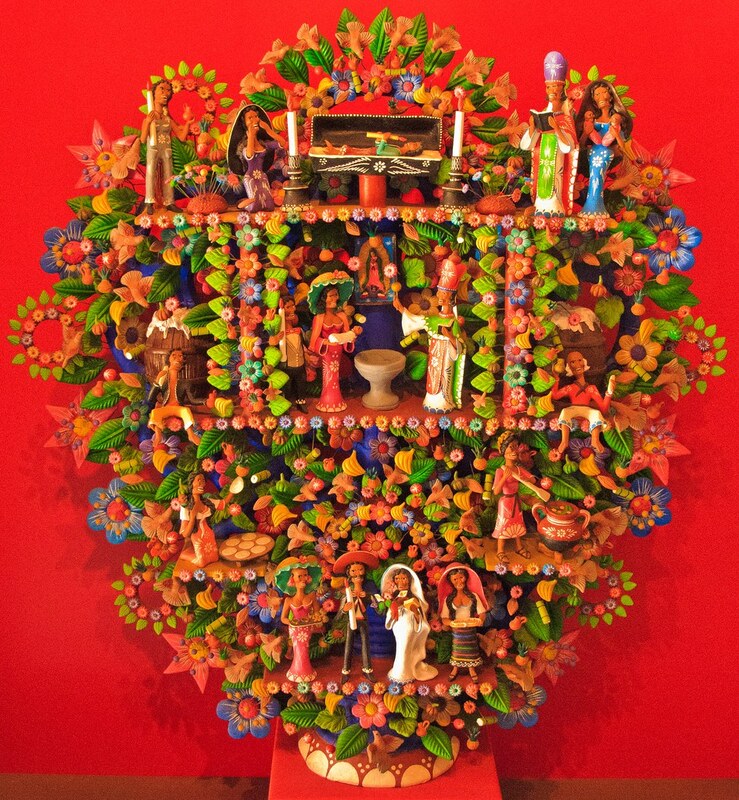 There are many words used to describe Mexican Folk Art, but colourful comes near the top of the list! After exploring the city on foot we hired a car and started to look at the surrounding countryside. 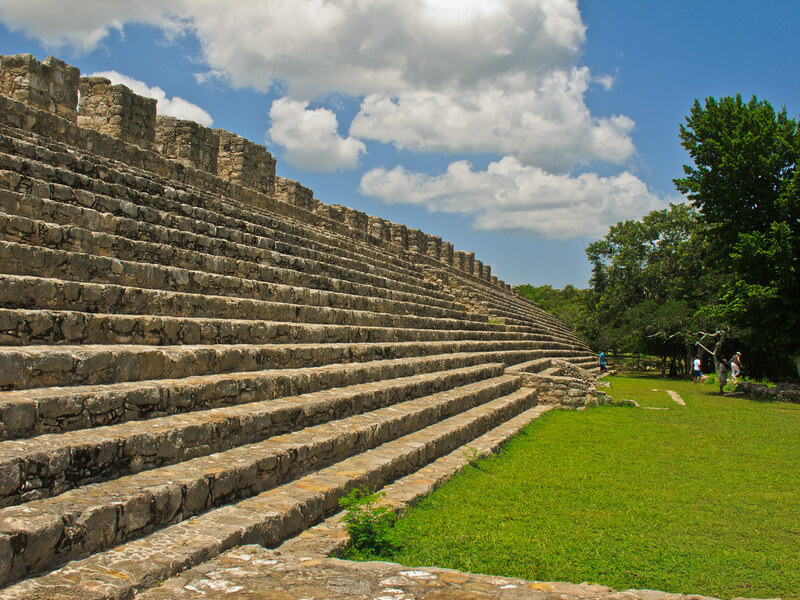 Our first outing was to Dzibilchaltun which is just to the north of Merida. 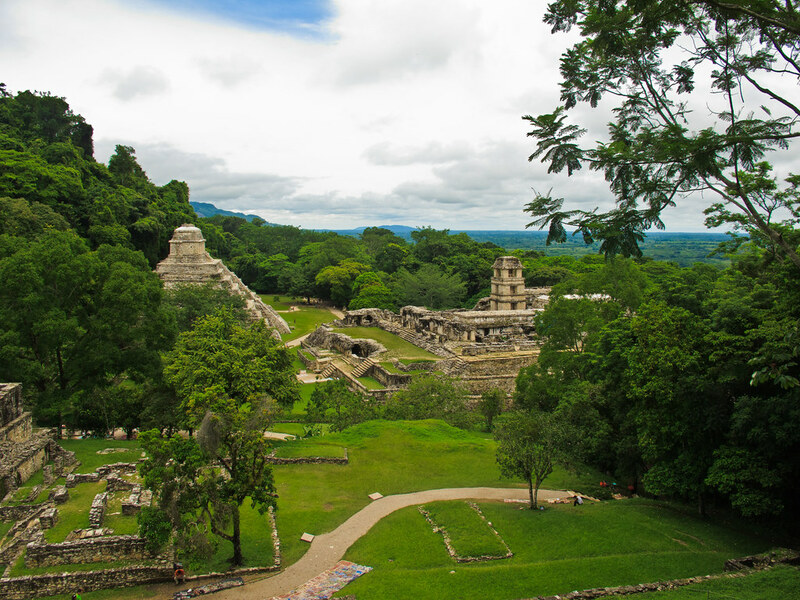 This is an extensive site with a temple at one end and palaces at the other connected by a long straight avenue. You can see the layout of the site (if you have Google Earth installed) by clicking HERE. Download the dzibilchaltun.kmz file to your desktop and click on it. It will open in Google Earth and show you our route and where we took the pictures. You will see all the pictures we took that day. 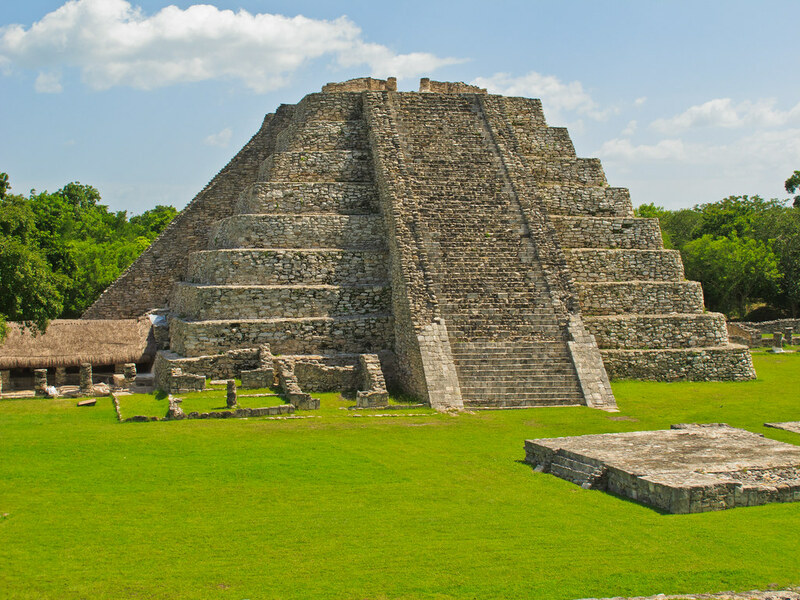 The site is very impressive and, like all the sites we saw in Mexico, well looked after. We had a brief tour by one of the wardens who told us that the Temple was aligned with the sun which shone through the doors at the Easter solstice. 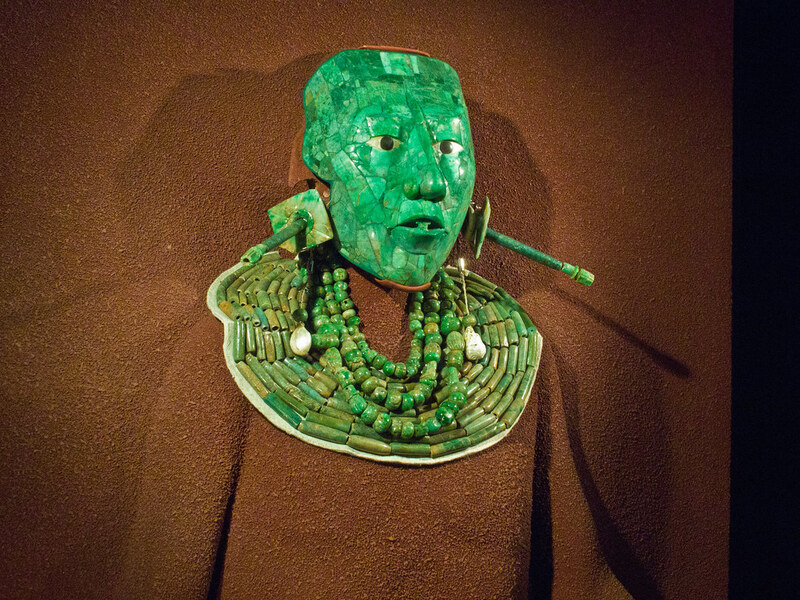 To him, this indicated that the Mayan religion was compatible with Christianity. 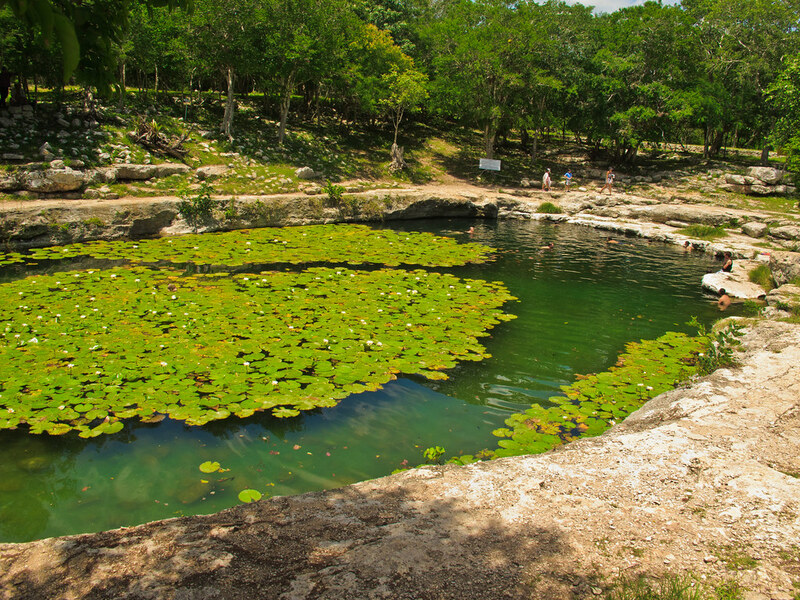 But the best thing about Dzibilchaltun was that it had a water supply in the form of a cenote. 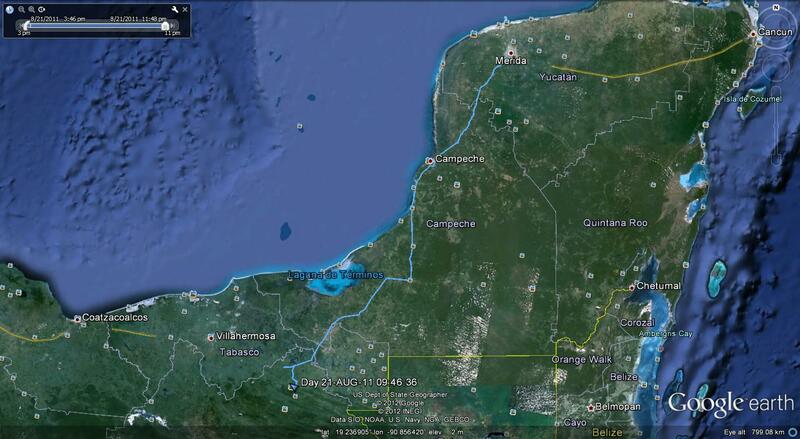 The Yucatan is made of limestone and has no surface rivers. 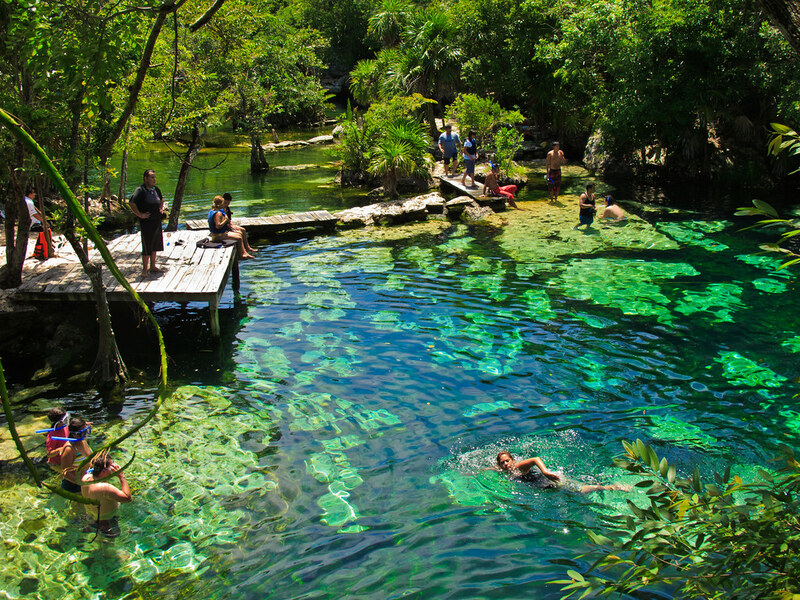 But there are subterranean ones which occasionally reach the surface in the form of cenotes. The one at Dzibilchaltun is like a large pool very suitable for swimming and this was much appreciated. 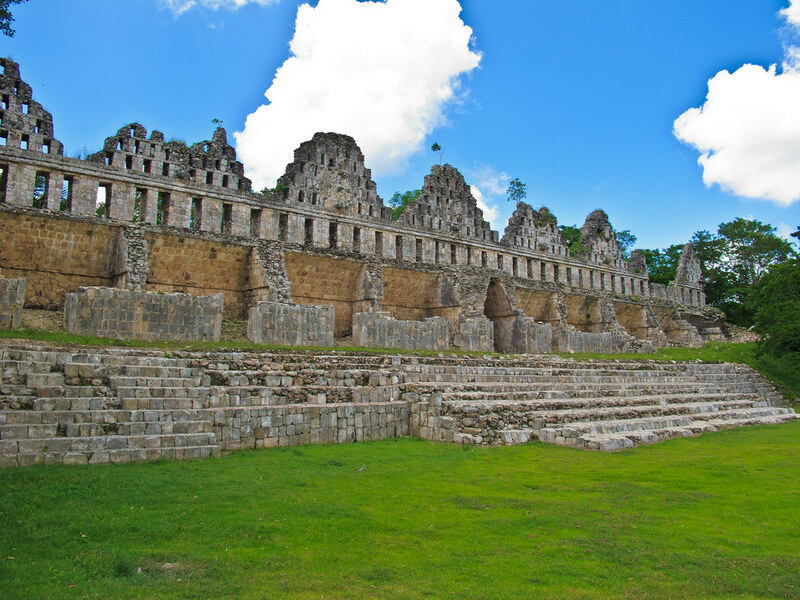 The next day continued our exploration of ruins and cenotes. Our route with pictures can be found HERE. Our first stop was the village of Acanceh which has a couple of pyramids in the centre of the village. 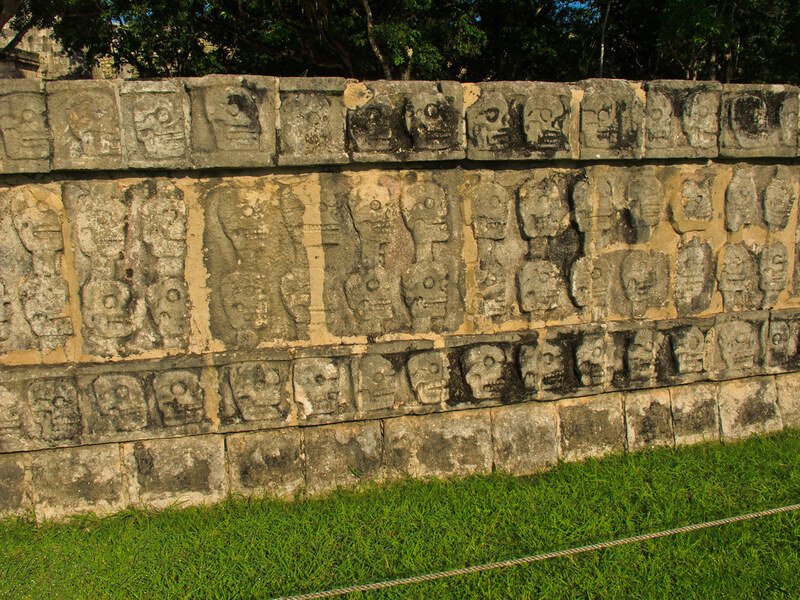 These are distinctive as one has carved masks and another has stucco friezes. And they have a very friendly and informative custodian who delighted in showing us round. It was a pity that his English was as good as our Spanish! 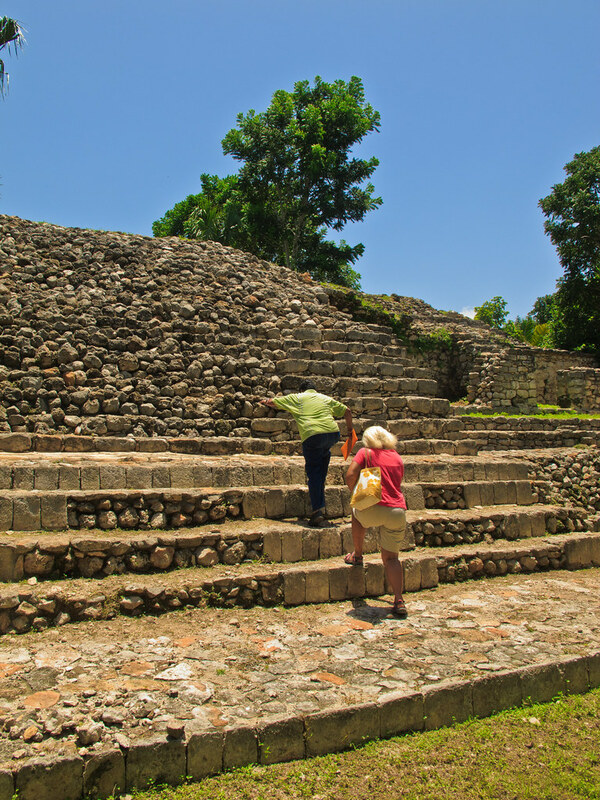 Then we headed for Mayapan which is one of the largest Maya sites in the Yucatan. 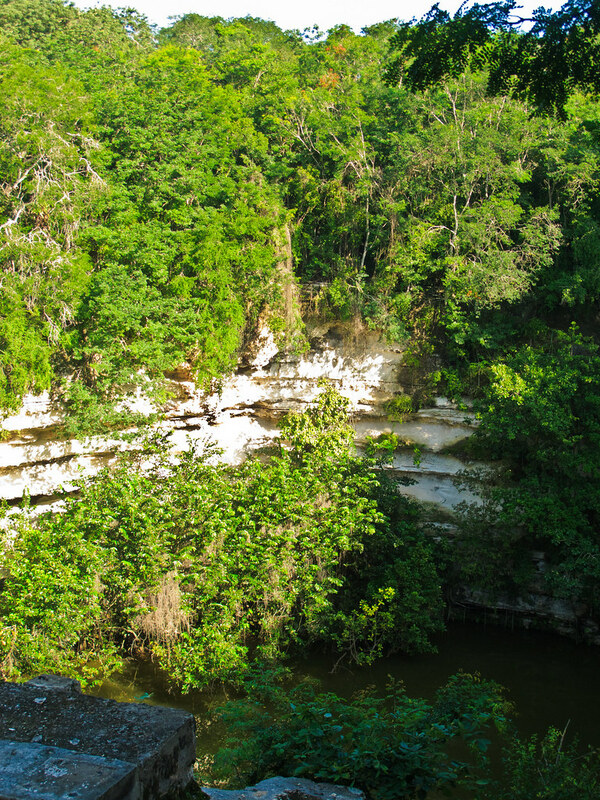 But first we stopped off in the village of Telchaquillo to have a look at its cenote. Unlike Dzibilchaltun it is underground. 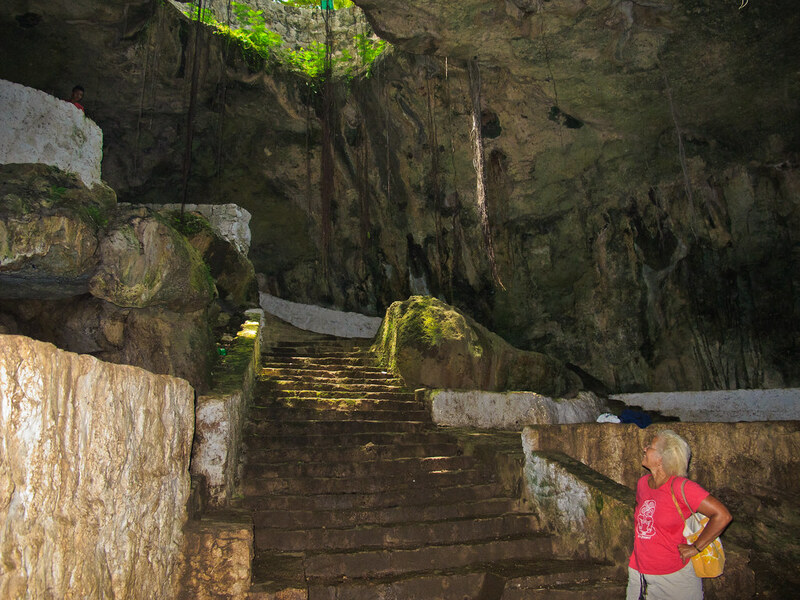 Presumably its underground river dissolved and carved out a cavern at some time in its history and the roof collapsed in places to allow access. In a hot and dusty village it is a welcome relief to find some cool shady water. 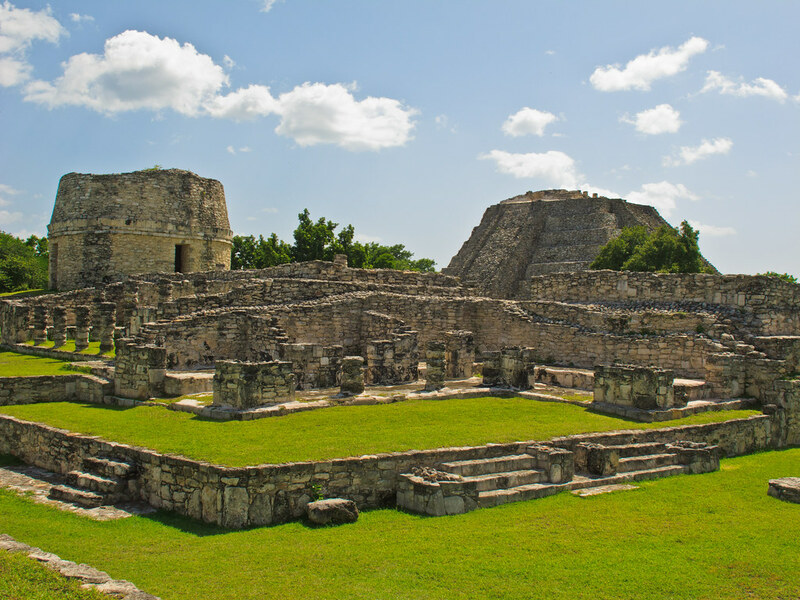 Then it was onwards to Mayapan which was virtually empty of people but full of Mayan ruins. 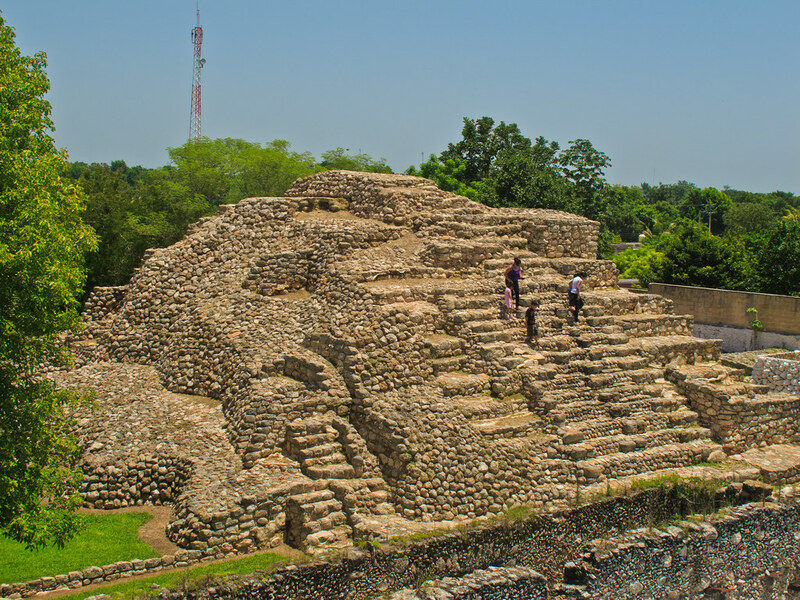 It is probably the youngest of the major Mayan cities, falling into disarray in about 1440. 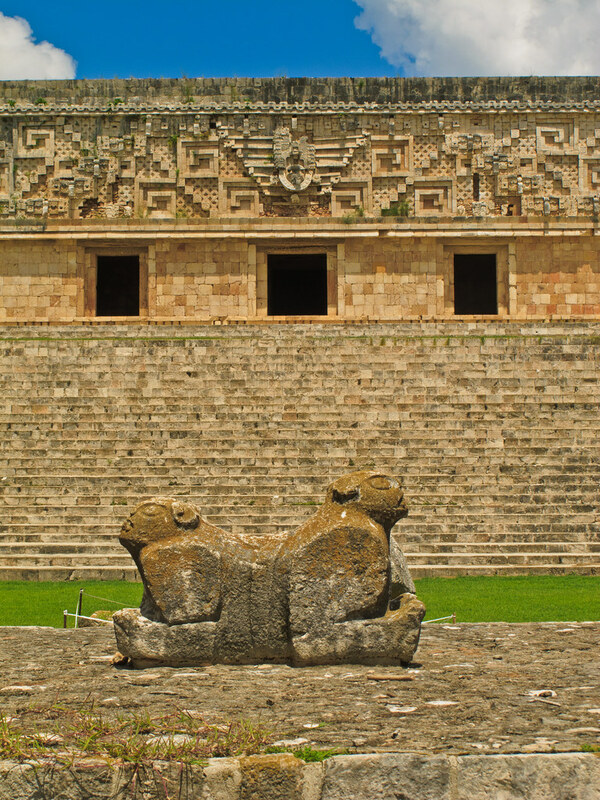 I cannot claim to know the history of the Maya – the more you read the more complicated and contradictory it becomes – so I will content myself by presenting the prettiest photographs I have. 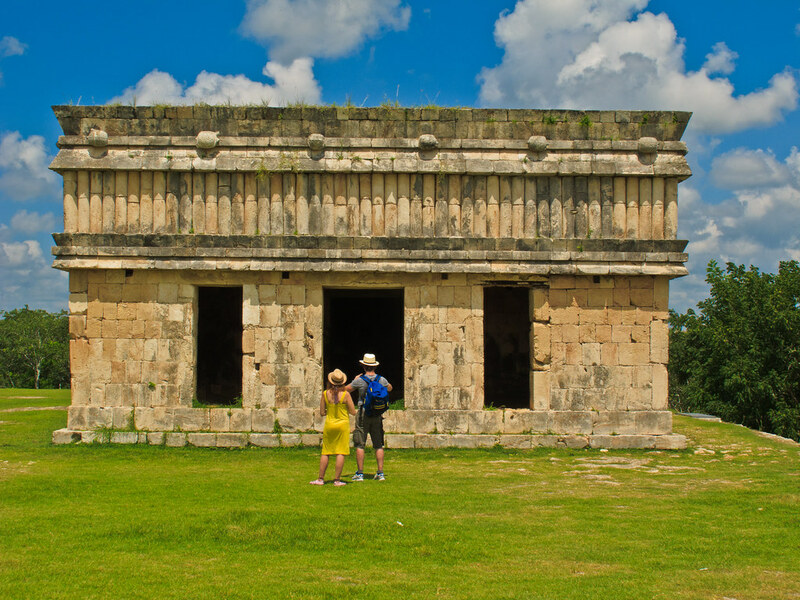 A few days later we went to Uxmal. The route with photos can be seen HERE. This is 40 miles south of Merida and in slightly hilly country – not the dead flat terrain we had been in in the previous ruinous visits. 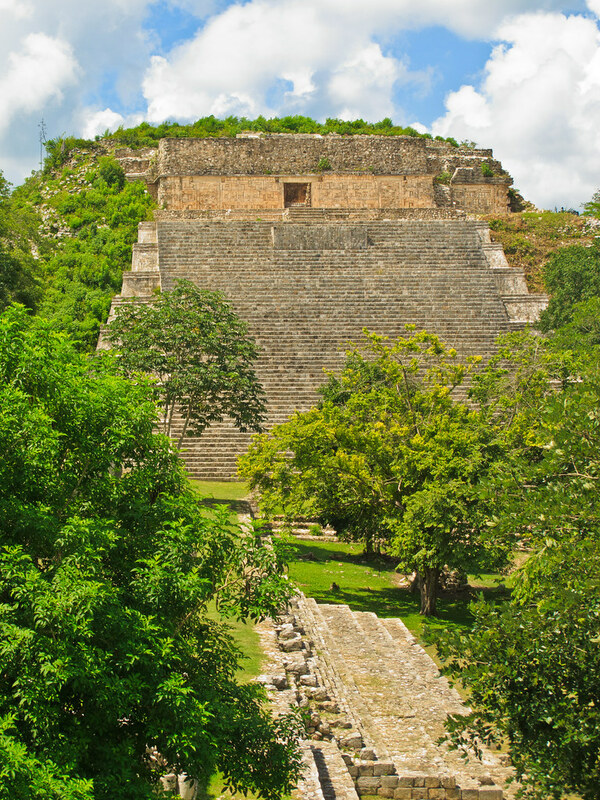 Uxmal looks much less ruinous than other sites and better built and designed. Apparently it was flourishing about 900AD. I’ll let the photos speak for themselves. Anything I could add would be gleaned via Wikipedia or Google. And you can do that as well as I! 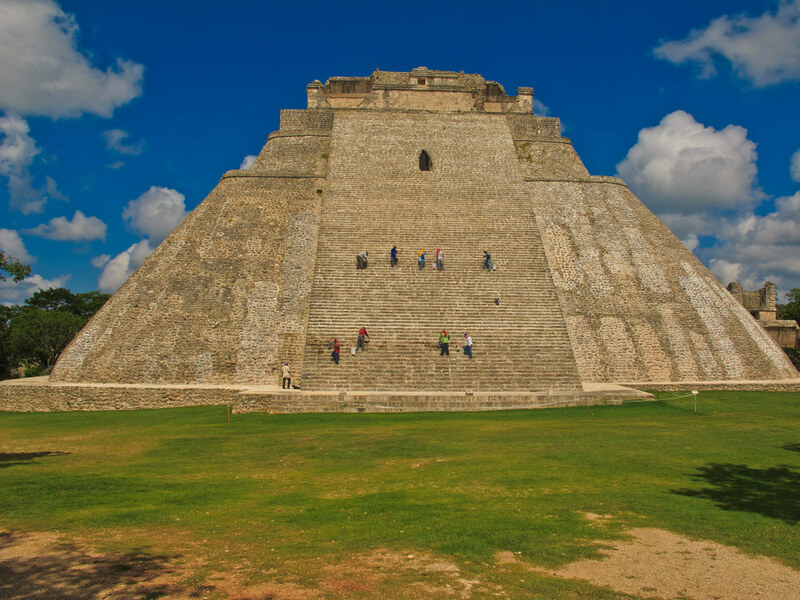 The Great Pyramid, Uxmal. 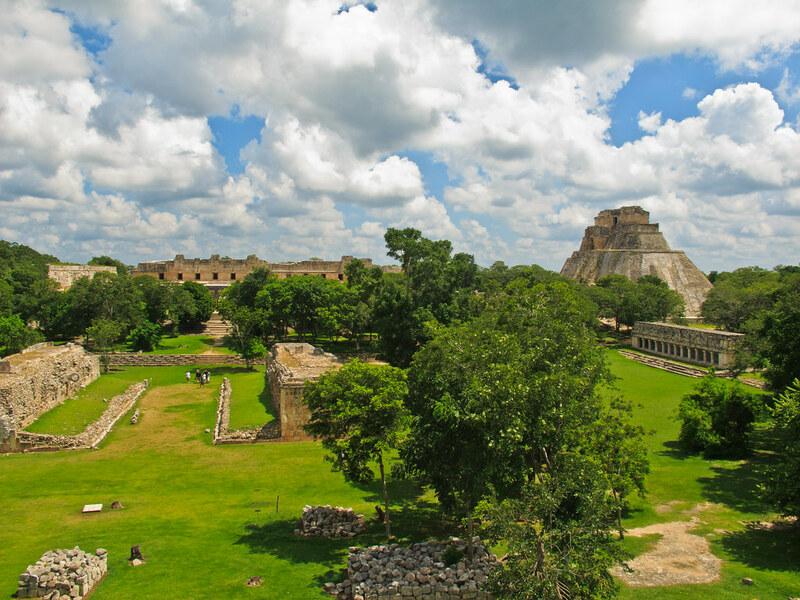 There is still a lot to excavate at Uxmal. By this time our stay in Merida was finished and it was time to move on. We had arranged for us to leave the hire car in Playa del Carmen, near where we were going to spend the last week of our trip, so we were free to drive where we wanted. 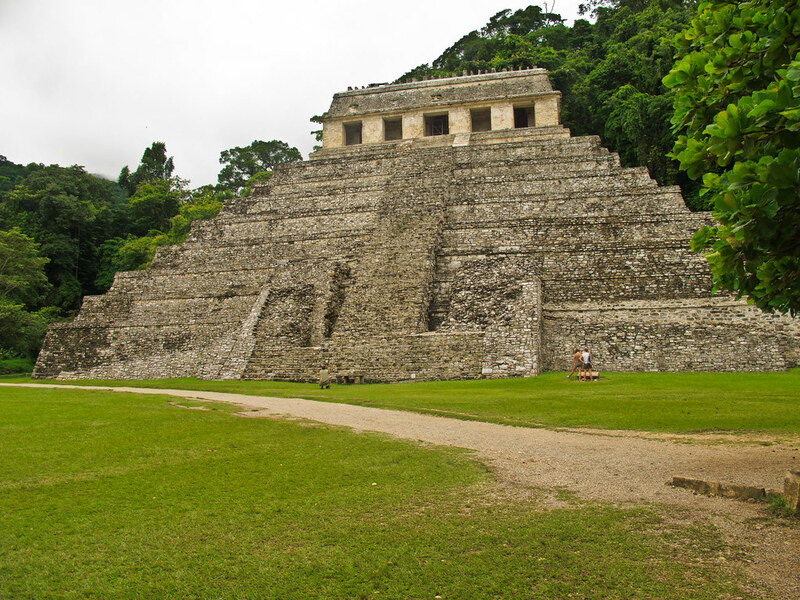 We decided to visit Palenque in Chiapas State and also Chichen Itza. Incidentally, when we were first hiring the car we were going to get a nice one with automatic gears, air conditioning, CD player etc. Then we mentioned we were going to Chiapas. Faces blanched and we found ourselves with a basic model with a radio. Yucatan is Mexico’s most law abiding state. Chiapas isn’t. 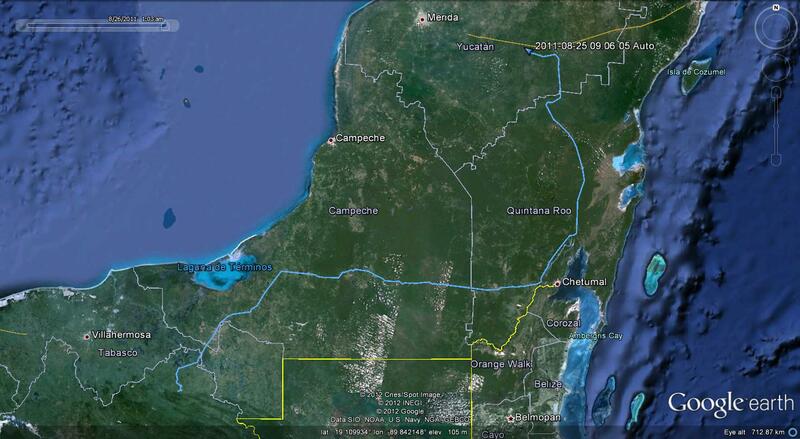 It was a long drive of almost 340 miles to Palenque and it took us all day. We were glad to check in to our hotel, which was almost empty and have a swim in the rather nice swimming pool – probably the best pool we had after Singapore. 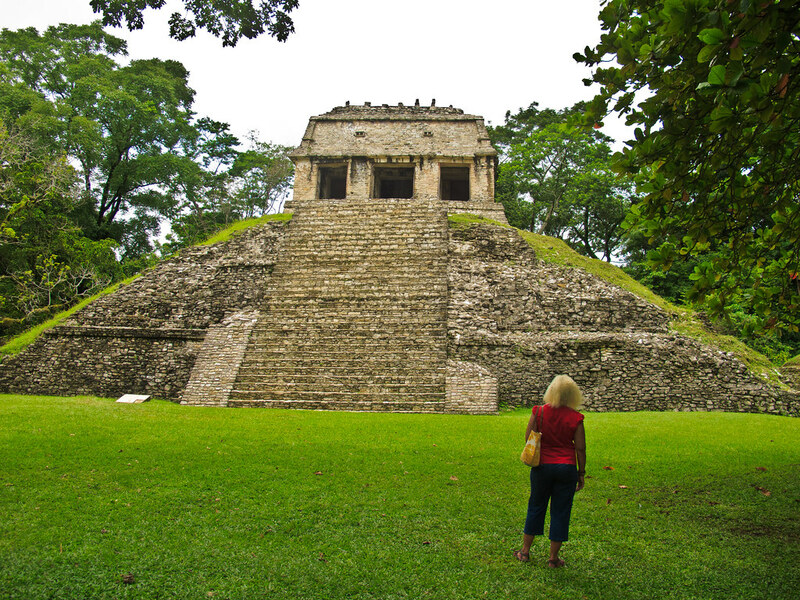 Early the next day we drove up to Mayan Palenque. Most of what we see today was built in the 7th century AD, but the history of the place extends from earlier than 200BC to about 1100AD when it was abandoned. The quality of the buildings has been commented on and one of the most spectacular exhibits in the Anthropological Museum in Mexico City comes from here. 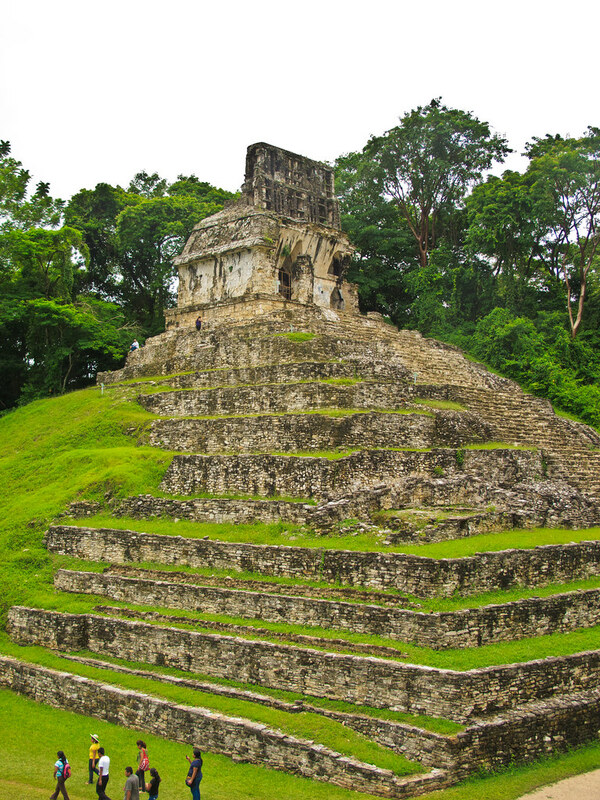 Our route and photographs in Palenque can be seen HERE. 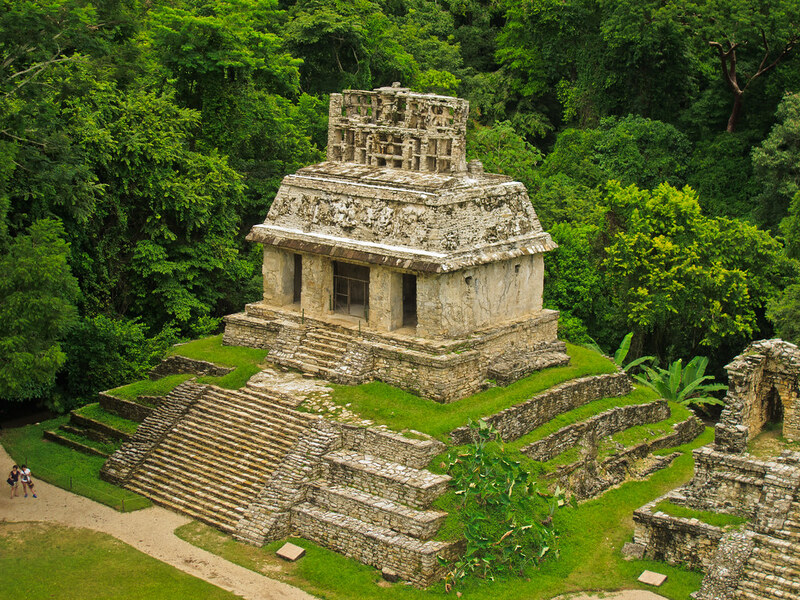 Temple of the Inscriptions, Palenque. 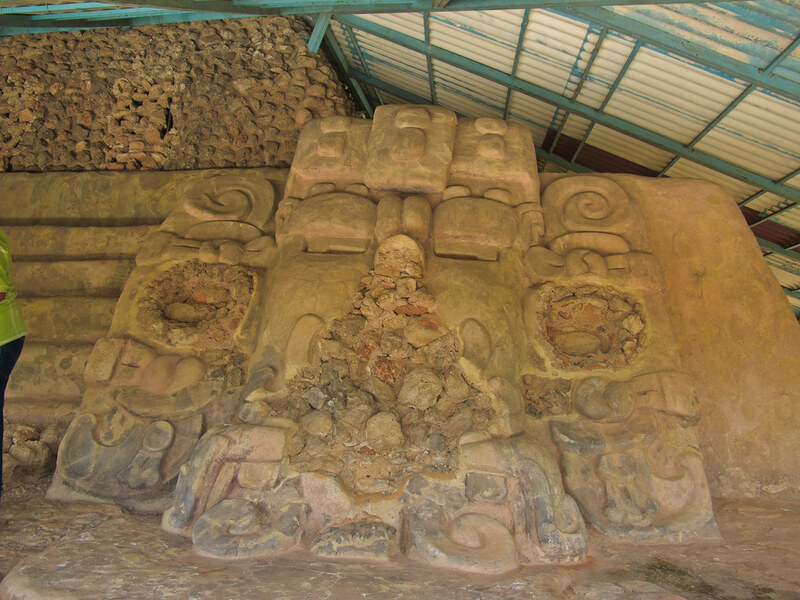 Pacal’s tomb was under this. There are many spectacular buildings on the site and there follows photos of some of them. So far only 10% of the site has been excavated. 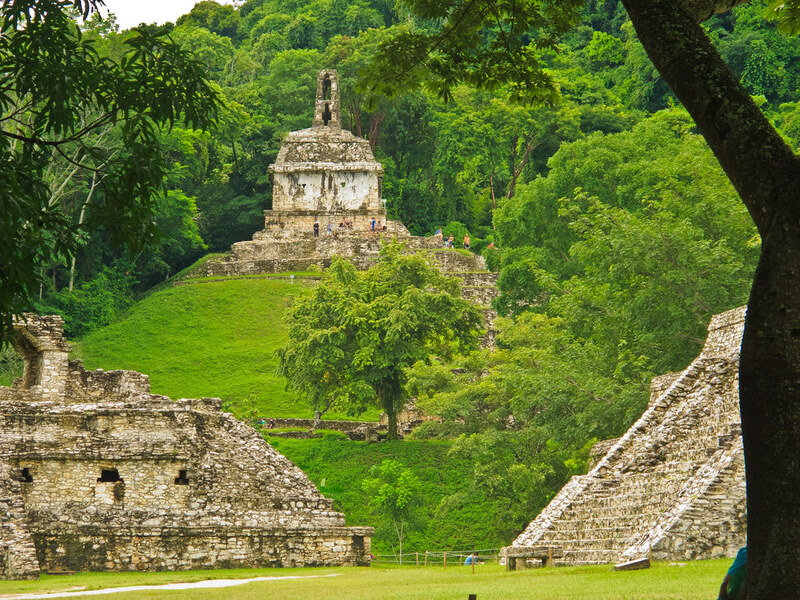 There are many structures in the jungle which appear as steep, tree-covered hillocks. 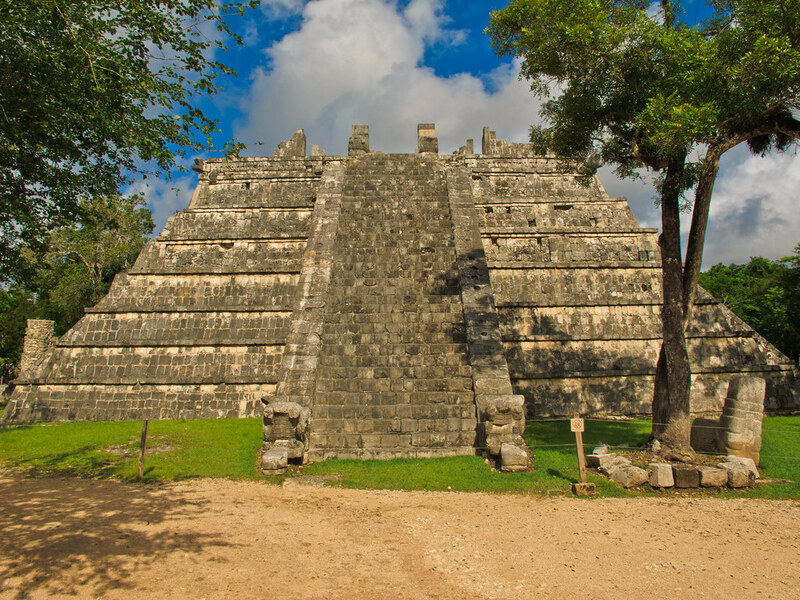 We then had along drive of almost 500 miles to Chichen Itza. Our route is shown below. 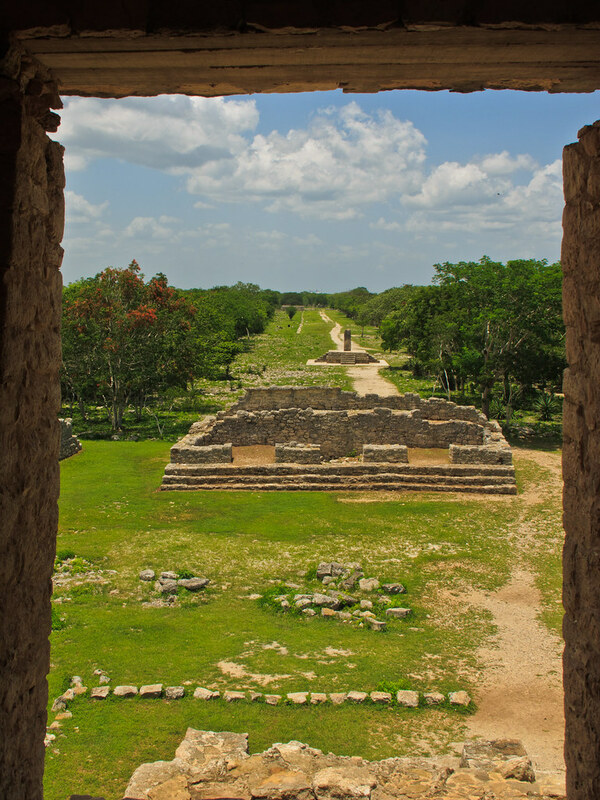 It was a long way made memorable by the number of road works – many roads are being improved in the Yucatan, unfortunately the idea of town bypasses has not yet occurred – and by the heavy thunderstorms we passed through. 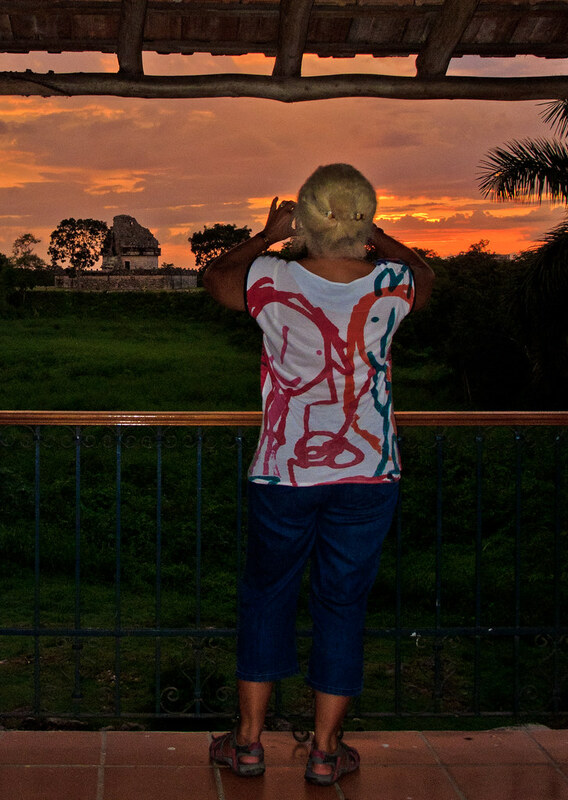 But eventually we got to our hotel in Chichen Itza, where we were in time to catch a nice sunset. 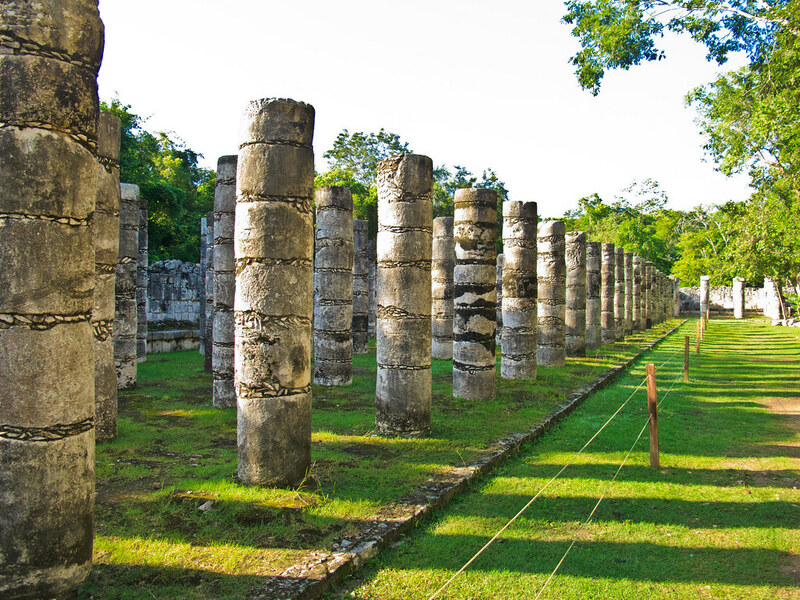 Our hotel was the first at Chichen Itza and was from an earlier era. It had a slightly faded glory but was still very comfortable. We were there in the low season and it was rather empty. 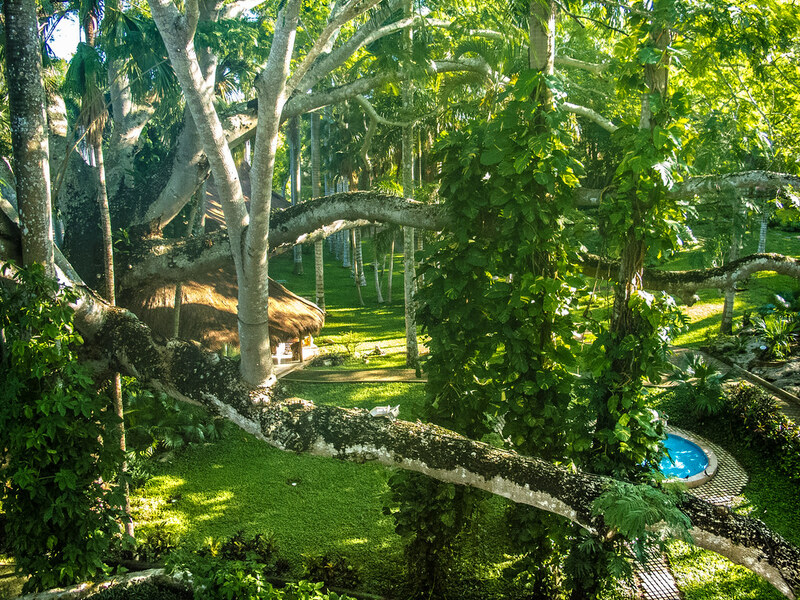 Rooms and the grounds were magnificent and there were some old and massive trees just outside our window. 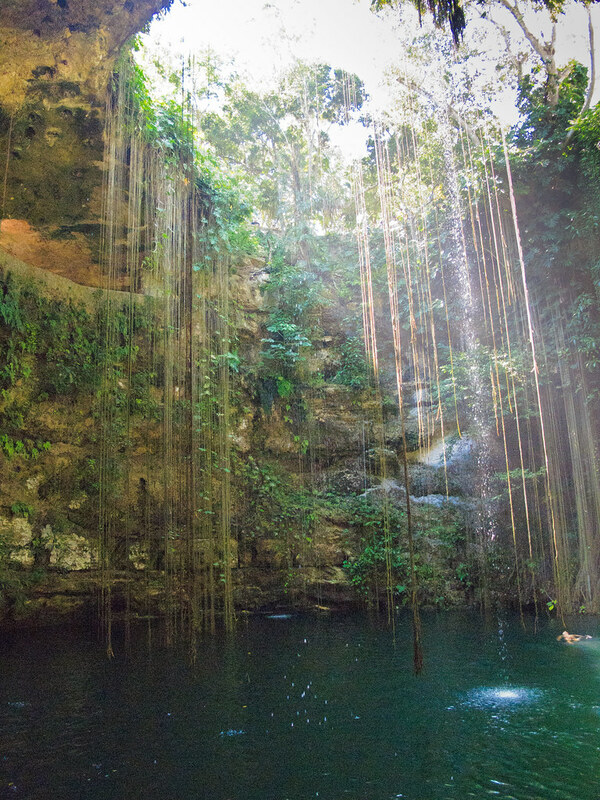 On our first full day at Chichen Itza we decided to take a rest from walking the rubble and have a swim at Ik Kil cenote which is a couple of miles away. It is like a miniaturised version of Rubislaw Quarry in Aberdeen, except that it is only slightly changed by the hand of man whereas Rubislaw is entirely man made. But they are both deep holes with water at the bottom. A stairway has been cut down to water level and you can hire costumes to go swimming. The water is cool and lovely with cat fish swimming about. 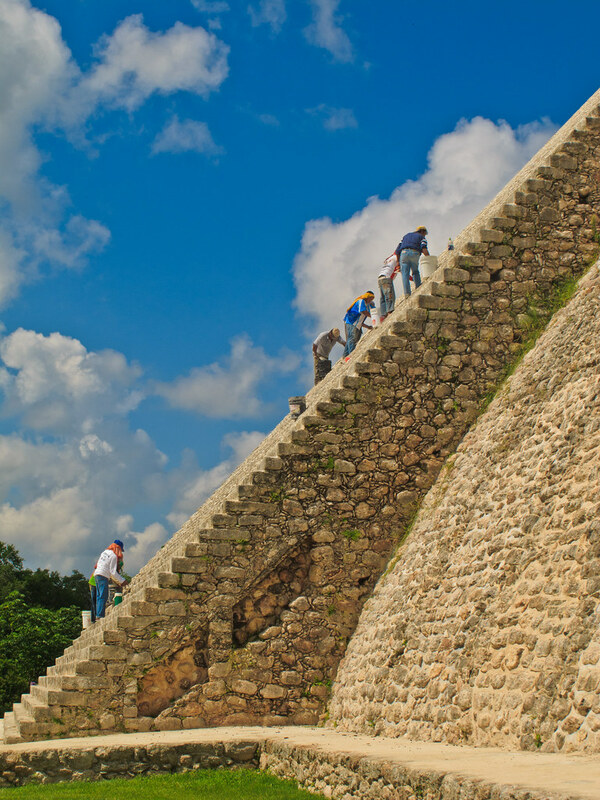 The next day we were up early and walked into Chichen Itza as soon as it opened. There is an entrance to the site from the gardens of the hotel. 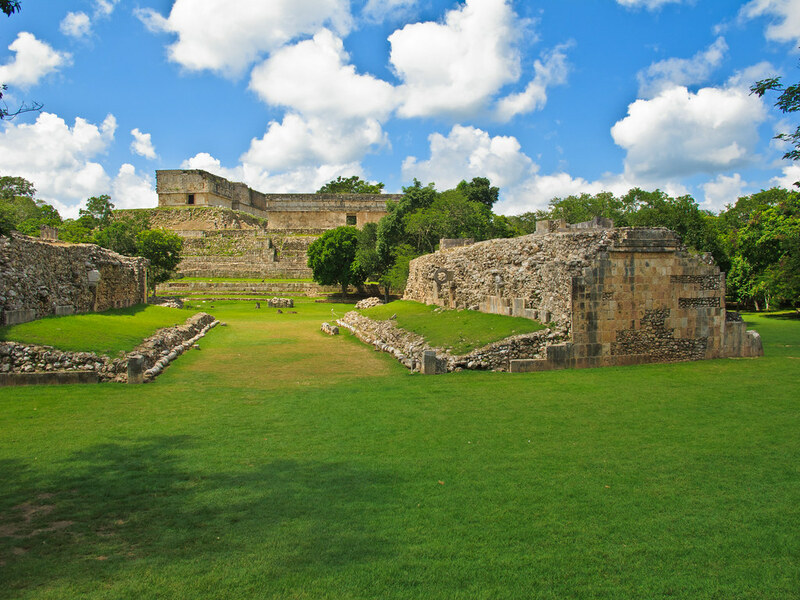 The place was important from about 600 to 1250AD, being the capital of large areas of the Yucatan. 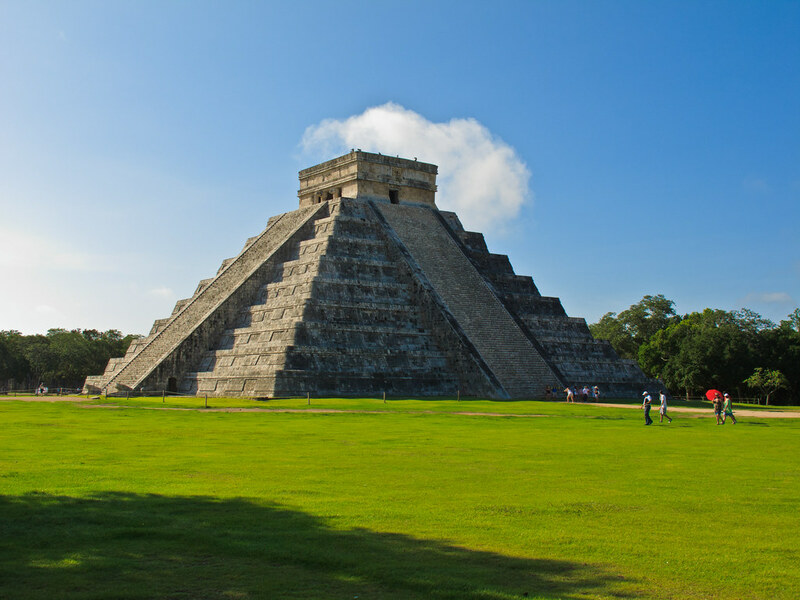 The structure which is emblamatic of Chichen Itza is El Castillo. 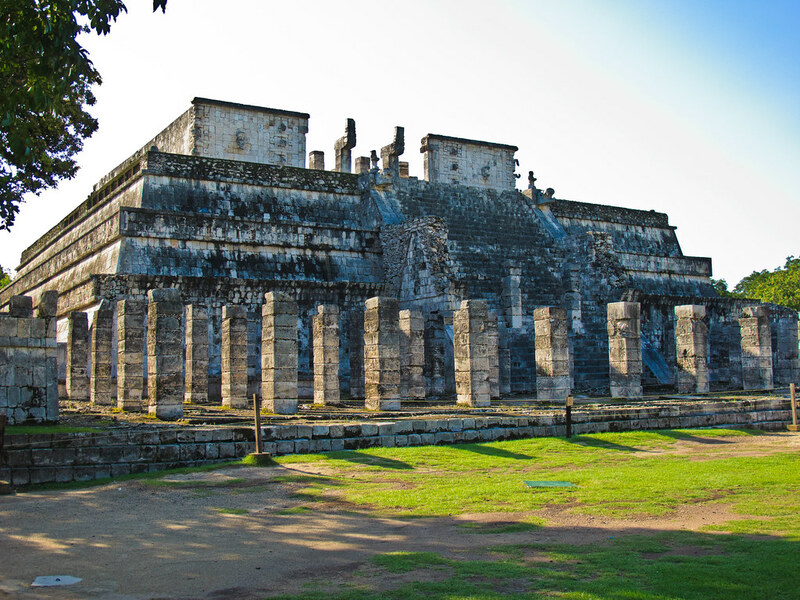 But there is a lot more to Chichen Itza than just the Castillo. 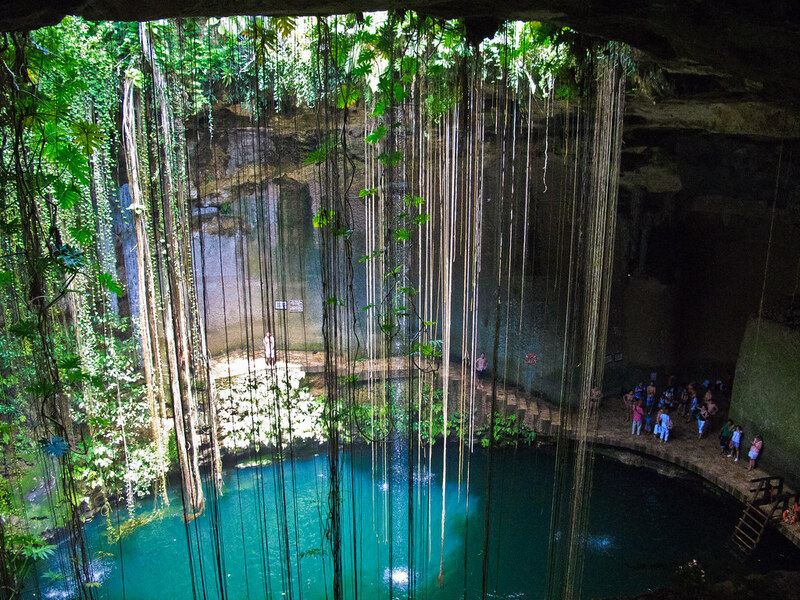 There is a cenote at Chichen Itza – the Cenote Sagrado – which was important to the religion of the Maya, but otherwise it does not have a great deal of interest. 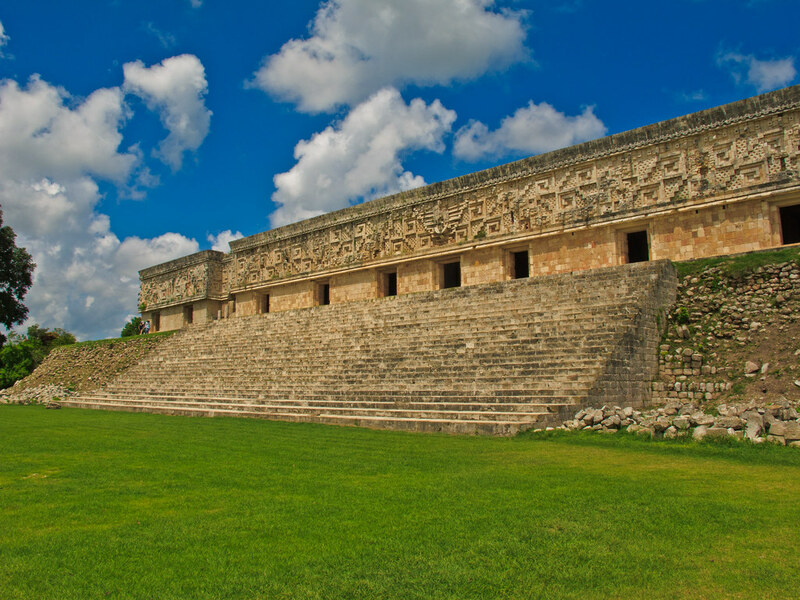 Perhaps the best short introduction to Chichen Itza is THIS Unesco document. Anything I wrote here about the place would be sucked out of this, so you might as well read it for yourselves! From Chichen Itza (or Chicken Pizza as it is known to jaded tourists) we went back to The Catalonia Royal Tulum Resort Hotel because we had enjoyed it so much and we wanted to end our round the world trip with something we knew we liked. And we did. There was a lot of lying round the pool and the beach, diving lessons for Chris – she now has a PADI Open Water diving certificate – and short trips to a couple of cenotes. Snorkelling in a cenote, Yucatan. 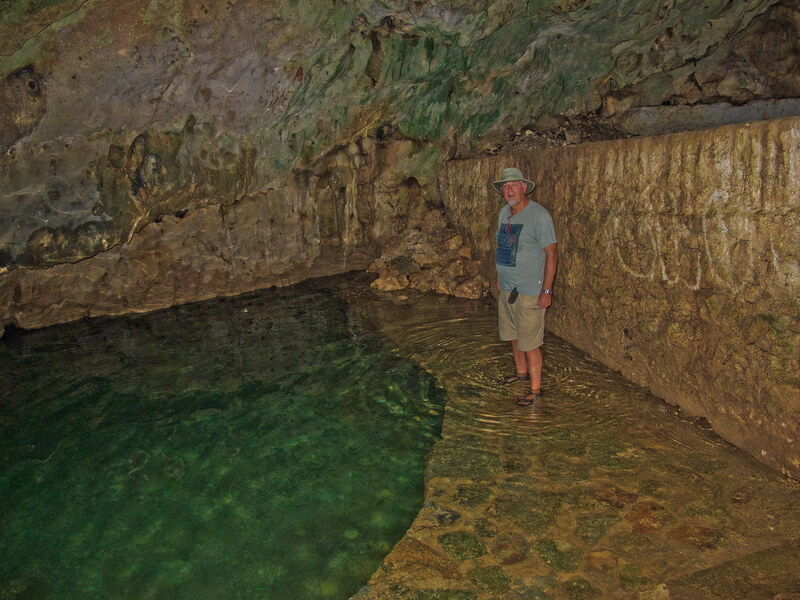 In this one you could swim in caves where there was a couple of inches of air between the water and the roof. Weird and wonderful! 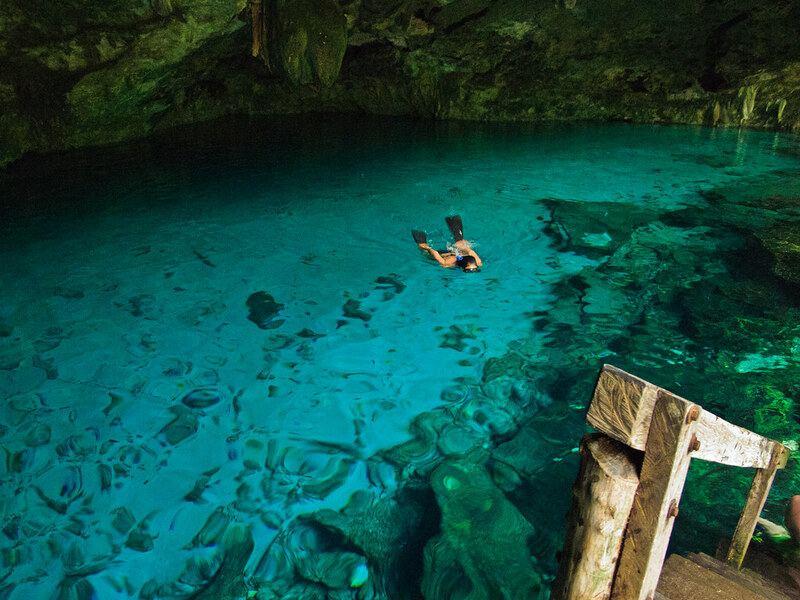 Swimming in a cenote, Yucatan. This cenote was filled with fish. It was like swimming in an aquarium. After a very pleasant week we got on a plane at Cancun and flew back to London, via Mexico City and San Francisco. And it was good to be home again. Our new (to us!) flat. Bryce, Zion and Coral Pink Sand Dunes! In the box below are links to .kmz files which can be used by Google Earth. Click on the file and save it to some place where you will be able to find it again - perhaps your desktop. Once saved click on it and, if you have Google Earth installed - and you SHOULD! - , it will open and you will see the photos taken, the route for the day and where the photos were taken.